Even though it's not even available to the general public yet, it's pretty obvious that the mere launch of TSTV and their mouth watering offers has managed to create a big competition among other satellite TV providers in Nigeria. 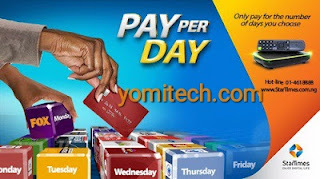 DStv and GOtv have both been trying so hard to retain their subscribers by introducing exciting new packages and offers, now star time has decided to join the trend by introducing a new "Pay Per Day" bouquet option which lets you watch up to 30 stations for just N60 only for a whole day. Aside the daily subscription option, StarTimes also introduced a weekly subscription plan which gives you access to up to 40 channels at just N300 for 7days (1 week). According to StarTimes, the new subscription plan will launch on the 1st of November this year 2017, and that also happens to be the same day TSTV plans to commence sales of their decoders.